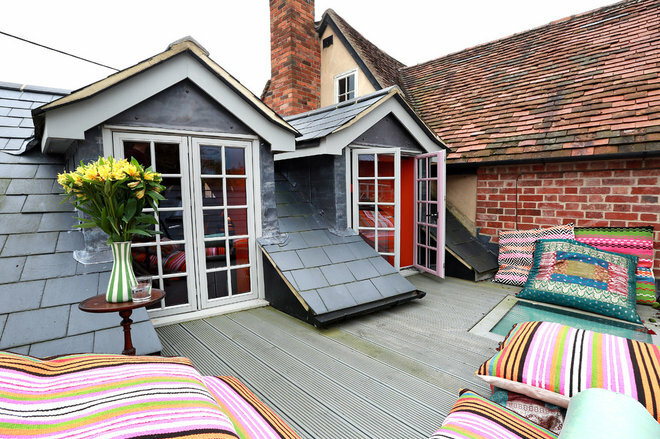 Flooring can help you make the most of your outside space, whether you have a small city roof terrace or a rambling garden. Varying the levels and textures is a great trick to add the illusion of depth and distance. 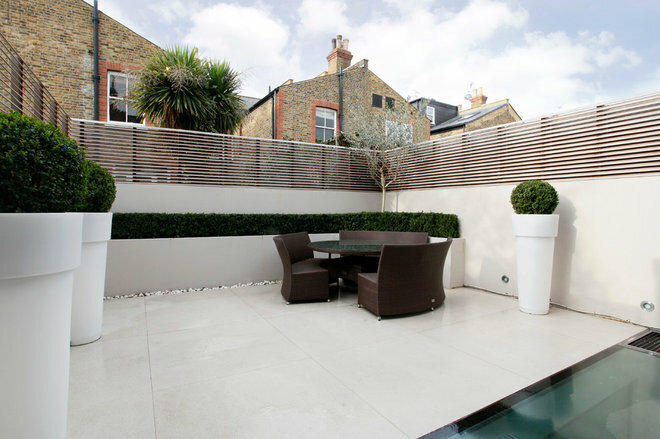 And the material you choose sets a mood that can be carried through in garden furniture, plantings and other features. Check out these examples of well-designed outdoor flooring to get your design juices flowing. Don’t stop: Take tiles up the wall. A skinny side patio can feel uninspired and suffer from a lack of light. 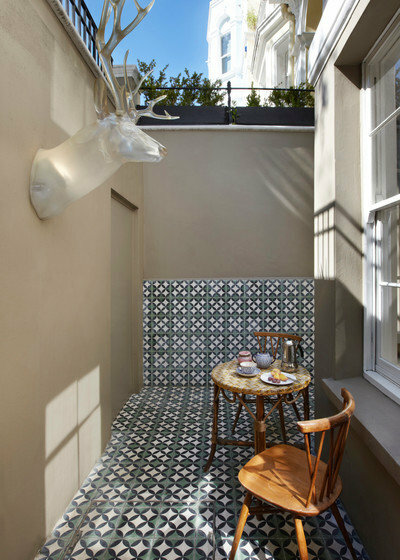 Add brilliance in the shape of Moorish tiles, and take them up a wall to create the feeling of more space. Up your game. Bringing parts of your garden up to a slightly higher level creates variety and interest. 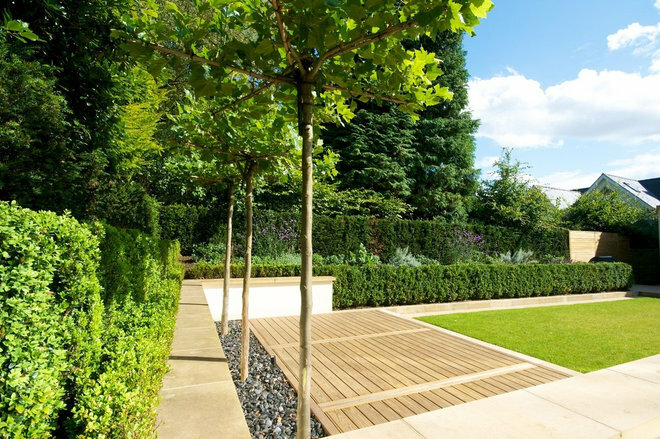 This landscape has a restful feel due to the coexisting planes, each with a different texture, from decking to lawn to paving. Add comfort to a roof garden. A rooftop terrace is a great escape for city dwellers. Decking makes it more comfortable and finished, and adds homeyness to the slate and brick skyline. Cushions in weatherproof fabrics provide the finishing touch. Go for large-format tiles. Big, bold and beautifully generous tiles can make any space feel more expansive. These large tiles work well with the plastered walls for a chic, simple space, adorned with a few choice planters. Wow with wood. The owners of this garden have used wooden flooring in the same way as they might inside the house. 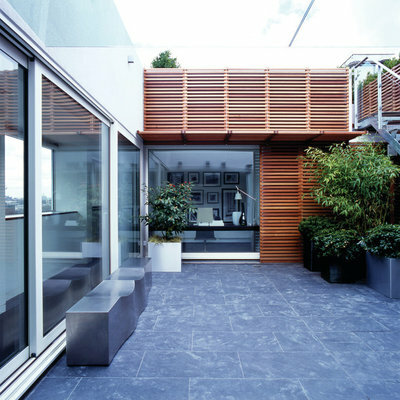 What better way to show that your outside space is an extension of your home? The expanse is broken up with raised beds and inset ponds. 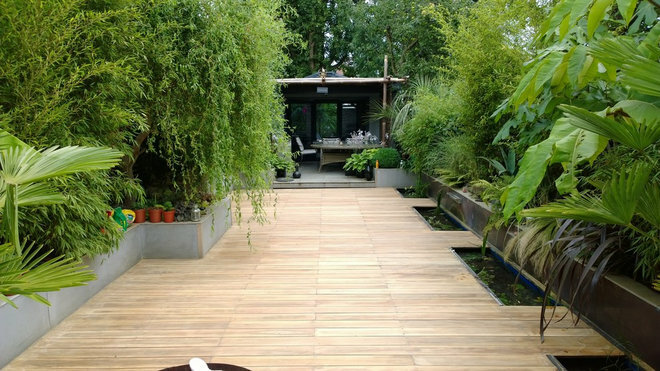 Of course, outdoor floorboards like these would need to be installed by a garden design expert and treated for the elements. Fake a lawn. 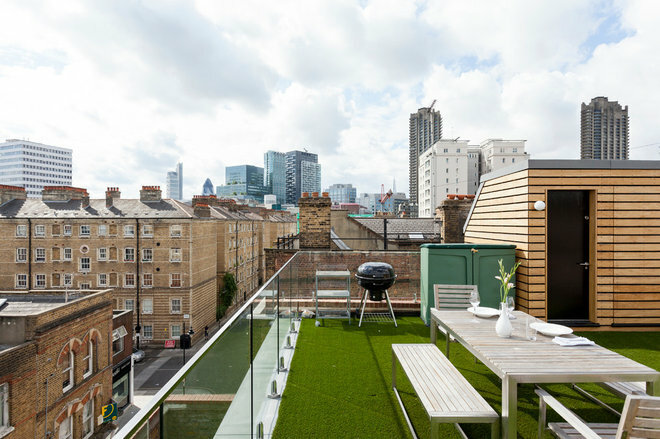 This central London rooftop space could feel cold and office-like if it weren’t for the emerald-green faux grass. We all know it’s fake, but that’s not the point. It simply adds a soft hint of the natural world. Artificial grass comes in lots of shades and qualities, so you can go as realistic or vividly fake as you like. Set the tone. Slate-gray tiles herald the mood for this contemporary patio, which is followed through in steely seating and gray planters and window frames. Repeat horizontal lines. The designer of this standard-size city garden used straight lines to bring its elements together and make it feel larger. Rectangular paving sets a grid-system base, while the fencing adds complementary horizontal lines. 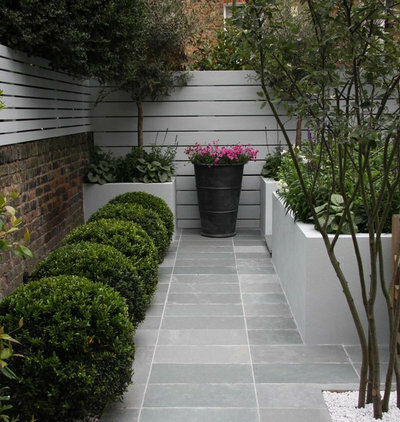 Square planters support the theme, and rounded topiariesprovide contrast. Simple and effective. Make a near-seamless surface. 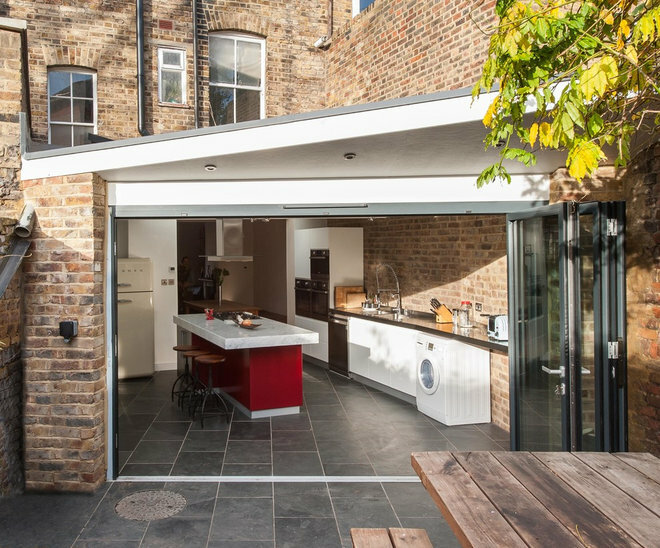 If you have bifold doors leading to your outside space, the whole idea is to have a flow between inside and out. So emphasize that with the same flooring in both areas. If you’re building or renovating a kitchen, it makes economic sense to stock up on floor tiles (suitable for outdoor use) and tell the tilers to just keep going. Define zones. Even in a small, grass-free space, you can create zones by laying out different shapes. Here, two stone circles in contrasting sizes mark out a seating area and a central hangout and play zone, while raised decking heralds the lounging spot. 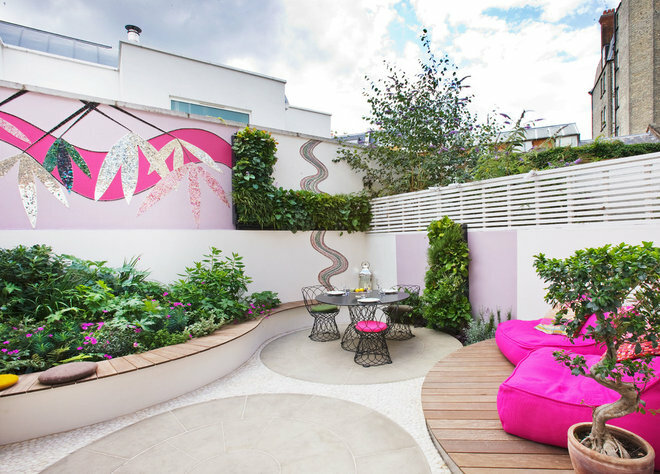 Serpentine plantings and decor reinforce the shapes in this creative compact backyard.